Far too often, we consider our subway stations mundane. We become inured from repetitive exposure to the familiar—so concerned and fixated with travelling to our destinations as quickly as possible, we forget to reflect on our physical surroundings. The banality of our imagination traps us, and enfeebles our perceptions of the world. Like all of the stops along the Spadina line, Lawrence West challenges us to break free of that mental fog. Designed by Dunlop Farrow Aitken, Lawrence West finds structural definition through its relationship with the Allen expressway: it both spans and runs parallel to the heavily-travelled asphalt artery. Within, the station’s refined interior provokes and stimulates. Claude Breeze’s gigantic 300 foot ceramic mural, Spacing... Aerial Highways stretches atop the station’s north face, both inside and out. I have no idea what message this evocative work is supposed to convey. But perhaps that’s the point. I felt obligated to return to Lawrence West for a second visit, to ride the station’s freshly-minted elevator. Installing the device was an eight year fiasco that proved emblematic of TTC project mismanagement (to Andy Byford’s credit, upon assuming the helm of the Commission, he recognized the situation was unacceptable, and explicitly listed the elevator’s completion as a critical milestone for his new tenure). One other egregious feature necessitates mention: the ‘secret’ cutout window at the Lawrence Ave. north-side entrance. Standing at this portal, patient watchers can observe raptly and feel the vibration, as trains emerge directly beneath, metal leviathans snaking their way to freedom. 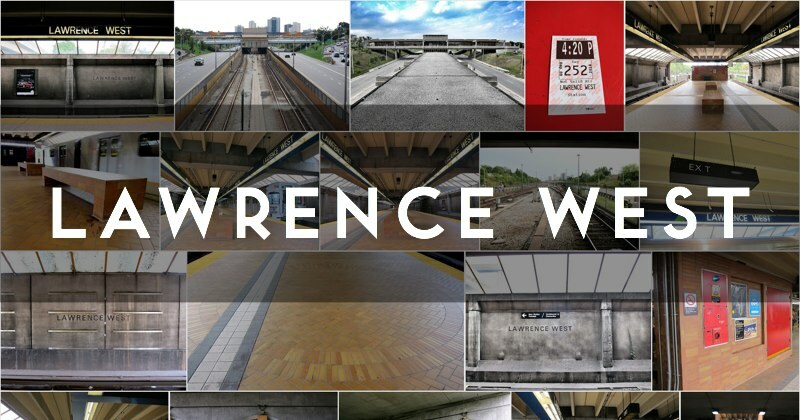 Lawrence West opened to the public January 28, 1978 as part of the Spadina Rapid Transit extension to the subway.